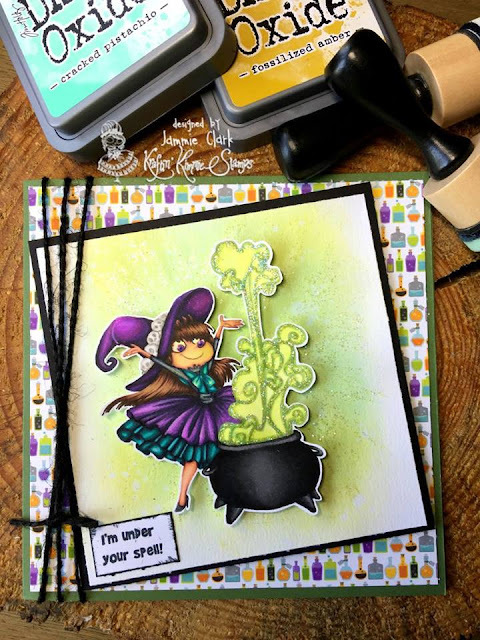 I decided that I couldn't go any longer without showing you guys the Witch I began coloring on a color along not so long ago.... so here's the finished card! I use a TON of Stickles on this card, and it's a shame you can't see it in the photo, but this thing glitters like there's not tomorrow... the background is made with the distress inks you see in the photo and then i used a flat paint brush to paint streaks of glittery Stickles behind this sweet little witch. The papers are from Doodlebug. We want EVERYONE to be able to play along so your submission can use ANY stamp and can be any theme, any style, any design and it can be a card, a scrapbook page, an altered item....you name it!! It must be a NEW creation and you can enter on this post until September 19th at midnight! At the end of the month one random winner will be chosen from all the submissions for the whole month and will receive a $20 Gift Card to the shop!!! What do you think.....wanna WIN?? Let's see your krafty stuff!! Great card ! I love the green smoke ! !